1. 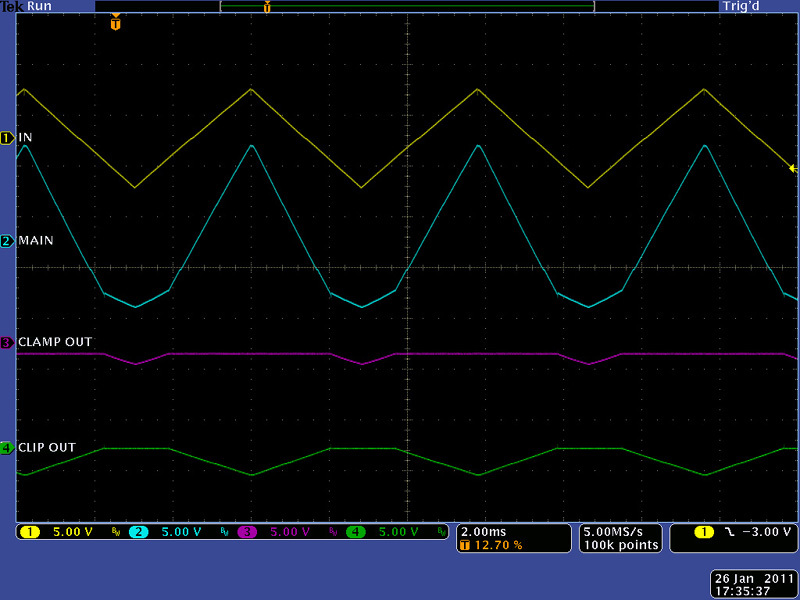 Changed R34 from 200K to 300K to set the Threshold range to +/- 5 volts. 2. Changed R49 and R53 from 68K to 47K to center the Fold control. 3. Added 1uF capacitor in series with main output since this module can create large DC offsets. 4. Replaced R10 with a jumper and did not install R2 and R9 on the unused op amp. "I always set it up so that the switch in the upper position will cause the WaveFolder to clip the upper portion of the waveform. That is, only the lower portion will get through if fold is set to zero. I tend to think of it as being the portion that is being folded." This the Wavefolder with a triangle input. Clamp Polarity is set to Upper and the Threshold and Fold settings have been adjusted to just fold over the upper portion of the triangle. The Clamp Out is the portion of the wave that has been folded and the Clip Out is the portion of the wave that has not been folded. This is the identical settings with Clamp Polarity set to Lower. You can now see the opposite or lower portion of the triangle has now been affected. 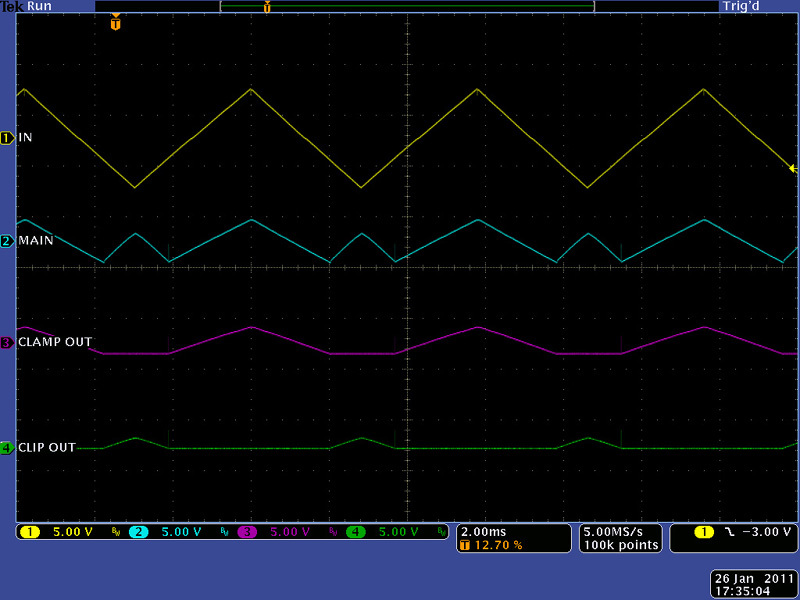 This is the same triangle input with Clamp Polarity is set to Upper and different Threshold and Fold settings. 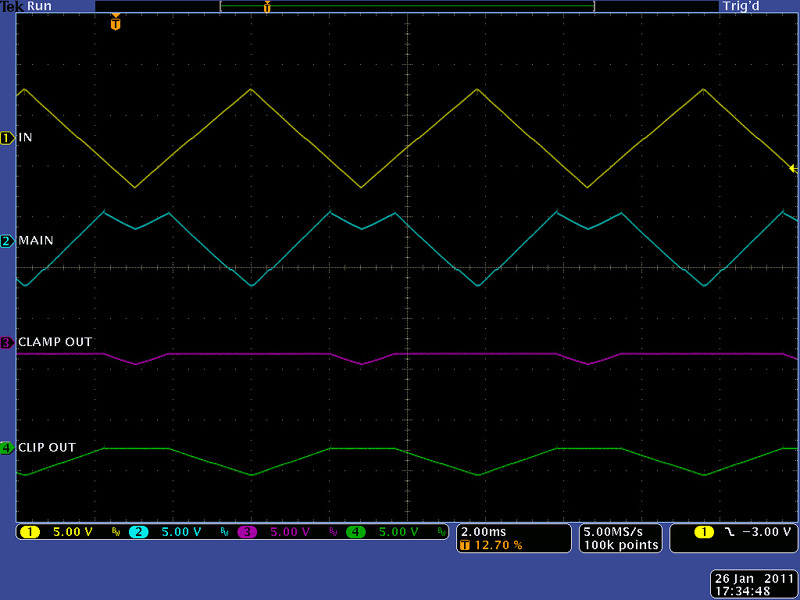 With these settings we are not folding over the waveform but rather changing the gain or slope of the triangle. This is the identical settings with Clamp Polarity set to Lower. You can now see the gain or slope of the opposite or lower portion of the triangle has been affected.